Though Shanghai is known as the pearl of China, not much is known about eastern China beyond the megapolis. The cosmopolitan port city is actually part of Jiangsu province, a province itself as large as South Korea. Not only in size, the province also boasts rich cultural traditions and economical infrastructure, inviting tourists and business seekers. It is also one of the richest parts of mainland China. Though many international tourists do not have the opportunity to explore past Shanghai, Jiangsu province has more cities worth the trip, such as Nanjing, Suqian and Yixing. Nanjing is a vibrant city with a rich history. Though a developed city with a total population of 83 million, the city is green with heavy forestry. From the historic old city center to newer areas, streets are well shaded. Residents use city bikes on their way to work or school. Nanjing may seem to be a modern city today, but it is also an ancient city that has served as the capital city of numerous dynasties. It is now the capital of Jiangsu province. Nanjing Museum, one of the largest museums in China, is a repository for the city’s long history. The 420,000 relics cover the Paleolithic period to contemporary China, but works from the Ming Dynasty (1368-1644) and Qing Dynasty (1644-1911) are the highlight here. The collection is vast and diverse, covering earthenware, bronze ware, calligraphy, bamboo carving, embroidery and more. It has more than 10 national cultural relics. Nanjing Museum is open every day from 9 a.m. to 5 p.m. Guided tours are available until 2 p.m.
Good news for foodies: the city is famous for duck. When thinking of duck dishes from China, Beijing’s Peking duck immediately springs to mind. But Nanjing has its own way with duck meat: Jinling duck. The style may be similar to Peking duck, but for this dish, the duck is soaked in brown soy sauce brine. Streets in Nanjing’s city center are packed with restaurants specializing in duck, serving everything from the wings to the tongue and heart. A three-hour drive from Nanjing, Suqian is a “small city” with 4.7 million residents. The city seems to be far from an interesting metropolis, as old apartments and low, run-of-the mill buildings greet tourists. But in the suburbs of Suqian stands Jiangsu Yanghe Brewery -- the equivalent of Scotland’s Johnny Walker or Mexico’s Jose Cuero. 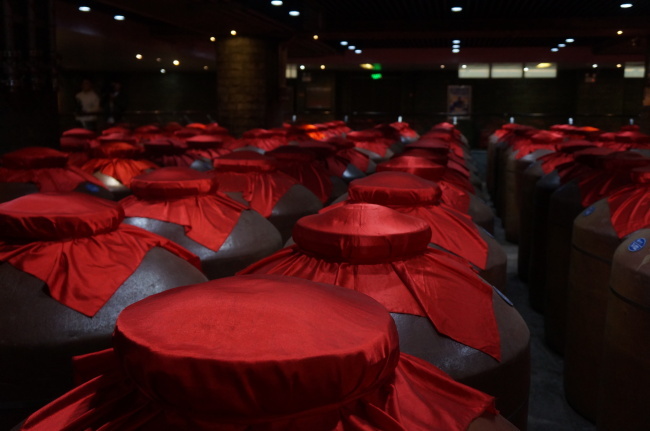 The modern brewery, which produces 19 tons of rice wine every year, recorded 44.3 billion yuan ($6.48 billion) in sales last year. Yanghe Brewery produces the classic Blue series (Dream Blue, Sky Blue and Ocean Blue), which is a must-have drink for Chinese gatherings and meetings. Though not an everyday drink like beer, the clear spirit is something not to be missed for important occasions. The endless rows of conveyer belts shipping out stacks of rice wine showcase the rapid growth of China’s economy. Employing 30,000 workers, the company is a big player in the regional economy. 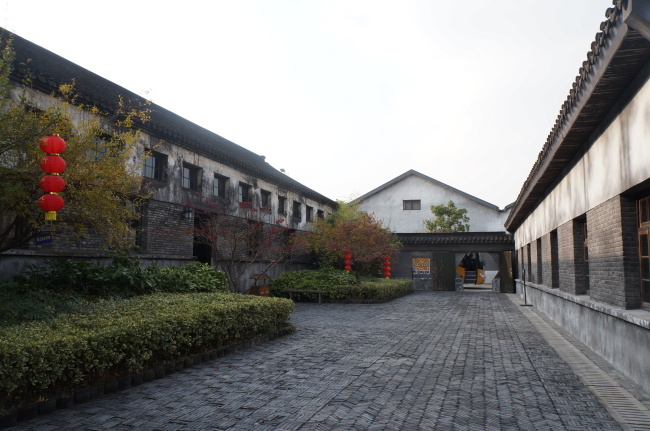 Founded in 1949, Yanghe Brewerywas originally more than one brewery. The government nationalized a group of private breweries to form a large state-owned brewery, which resulted in the brewery that covers a 10-square-kilometer tract of land. It was privatized in 2002. Visiting the old part of the brewery, you can see that this facility dates back from the early 1900s. A short drive from the modern factories, the liquor giant has preserved the ancient brewing houses, enhancing its cultural value. Man-made ponds surround the old buildings, completing an authentic Chinese-style garden. 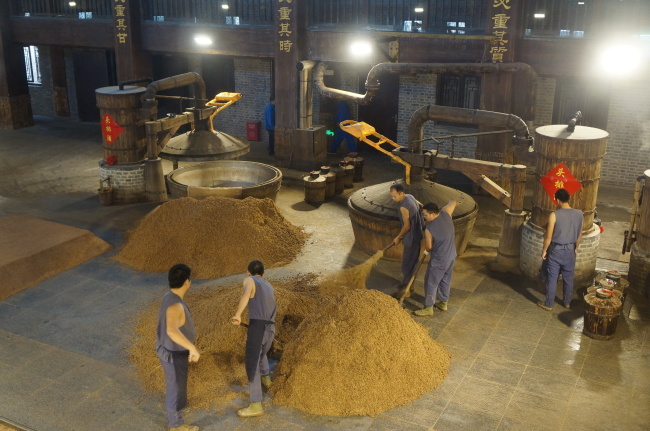 Huge pots containing enzymes for brewing rice wine are lined up inside ancient brewing houses. The company still uses the century-old ingredient for actual production. The brewery is proud to show that it follows the traditional recipe to make its rice wine, with men beating grains with broomsticks. Through the glass walls, visitors can watch them work in the traditional manner. For Koreans, there is a sense of familiarity associated with Yixing. Famous for pottery, the city greatly resembles Gyeonggi Province’s Icheon, Korea’s center for ceramics making. Yixing is a modest city like Icheon, valued for its artisan heritage. Even a foreign tourist can see that Yixing is all about ceramics upon setting foot in the city. Large hotels display locally made teapots and cups in their lobbies. As to be expected, the city’s Yixing Ceramics Museum showcases ancient pottery and works of art from the region. Though the pottery may not be as fine as porcelain works, it boasts its own unique charms in the durability and crude lines. The museum opens from 8 a.m. to 5 p.m. everyday. For those into nature, Bamboo Sea Scenic Spot may be worth a visit. 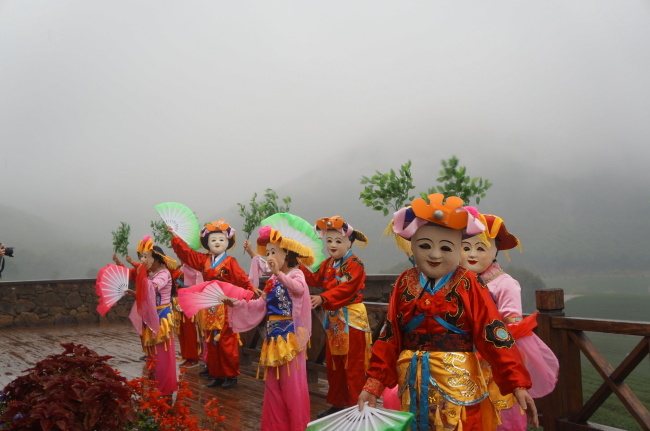 On weekends, the forest, a 30-kilometer drive out of central Yixing, bustles with locals on a hike. But on weekdays, it is tranquil and serene. Only the sounds of the wind are audible, as bamboo leaves form green waves. A small teahouse decorated in the traditional Chinese style is located atop the hill. 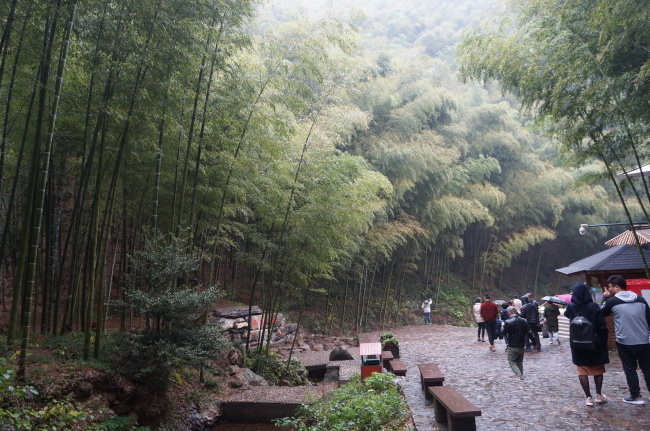 Visitors can grab a cup of tea, warming their bodies while filling their lungs with the green energy of the bamboo trees.